Fully set up Cecilio CVN-700 violins are finely crafted to meet the needs of a professional violinist. It features hand-crafted selected well-aged (minimum of 7 years) solid maple back and sides, hand-carved solid grained spruce top, beautiful inlaid purfling and semi hand rubbed oil finish. It has beautiful flamed back and sides with premium flamed one piece back. The violin is fitted with ebony fingerboard , pegs, chin rest, and tailpiece with mother of pearl inlaid and four detachable fine tuners. Violin package includes a pro-deluxe durable plush lined nylon covered hard shell case with straps and zipper pockets, high quality velvet interior, compartment for accessories, padded neck restraint, bridge protector, velvet blanket to protect your violin, and hygrometer measures humidity. 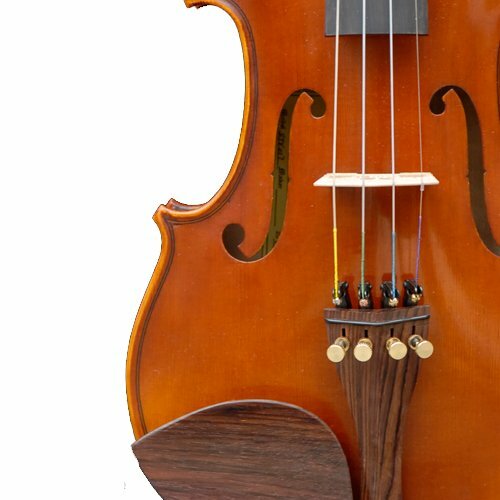 Violin also includes 2 (two) Brazilwood octagonal violin bow with ebony frog and unbleached genuine Mongolian horsehair, adjustable shoulder rest with soft foam padding & soft rubber feet, quality rosin cake, violin bridge and an extra set of quality violin strings. Buy with confidence as it comes with a 1- year warranty against any manufacturer’s defects.